Most of VMware customers faced PSOD issue due to VMware tools version 10.3.0 on the virtual machines.This PSOD is due to the bug in the version for Windows OS and VMware has informed their customers about this issue. This version affecting only vSphere 6.5 customers and for fixing this VMware has released VMware tools 10.3.2 and made the 10.3.0 version deprecated. In Addition with 10.3.2 release VMware included AppDefense a security management and monitoring solution. This AppDefense agent can be installed on the guest virtual machine using the VMware Tools installer. Note that VMware Tools cannot install the AppDefense component automatically, you have install this component manually. This release of VMware Tools resolves a number of VMware AppDefense issues. It is recommended that VMware AppDefense users use VMware Tools 10.3.2. Note: VMware Tools 10.3.0 is deprecated due to a VMXNET3 driver related issue. 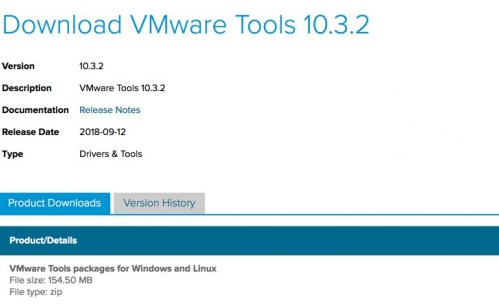 Install VMware Tools 10.3.2, or VMware Tools 10.2.5 or an earlier version of VMware Tools. • windows.iso supports Windows Vista and later. • darwin.iso supports Mac OS X versions 10.11 and later. • solaris.iso supports Solaris versions. • Integration of VMware AppDefense with VMware Tools: VMware Tools installation includes the VMware AppDefense, a security management, and monitoring solution. This data center security solution is based on application control, detection, and response. For more information, see the VMware Tools User Guide. • VMware Tools lifecycle using driver update from Windows Update server: This integration will allow you to update the PVSCSI driver during a Windows update. This feature supports PVSCSI for Windows Server 2016 only. • Shared folders: FUSE-based Shared Folders client which is used as a replacement for the kernel mode client supports Linux distributions with kernel version 3.10 and later. • VMware Tools user space compiler upgrade: Compiler for VMware Tools 10.3.0 for Windows has been upgraded to Microsoft Visual Studio 2015.